One of the most interesting and immersive exhibitions in 2019, is hosted at the Atelier des Lumières in Paris. “Van Gogh, Starry Night” offers visitors the opportunity to immerse themselves on a journey through Vincent Van Gogh’s prolific life and his sojourns in France and the Netherlands. From his early period to his later, radically different years, all of the impressionist painter’s landscapes, portraits, and still lives are on display. 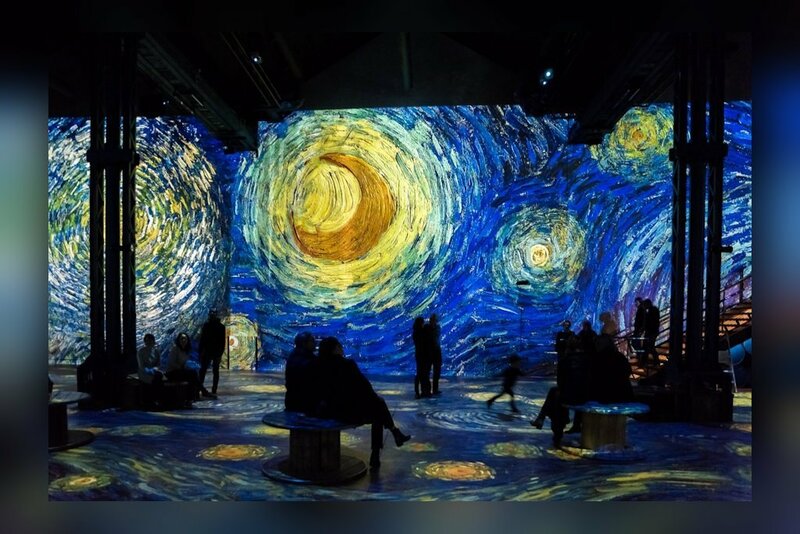 The “Van Gogh, Starry Night” exposition will run from February 22, 2019, until December 31, 2019 and will be a great must to do item on your sightseeing schedule while spending a holiday in Paris. The Atelier des Lumières Exposition. Occupying the entire space of the the Atelier des Lumières, a visual and melodic production will follow the intense life of the tormented artist. Expressing, at different points of the exhibition, the impression of water rippling in the light and falling droplets of water, the show is complemented by an impressive soundtrack. Culture spaces edited and produced the visual and musical work, which was directed by the recognized expert team of Renato Gatto, Gianfranco Iannuzzi, and Massimiliano Siccardi. The exhibition, Van Gogh Starry Night, wants to propose something unusual, and provides a different experience than classic museums showing the artist’s real works. The aim of this exposition is to allow the visitors to develop and feel a connection with the paintings of the artist, for example. Actually, the goal is that the audience becomes actors as if they are part of the works. Their shadows participate with the images and the visual effects, generating a different response based on the personal experience of the particular visitor. The memories that remain from this whole process will condense the full message of this exhibition, which you will quickly forget. A Complete overview of Van Gogh’s immense work. Van Gogh’s immense work, which drastically evolved over the years, from the Mangeurs de pommes de terre (The Potato Eaters, 1885) to the Nuit étoilée (Starry Night, 1889), Les Tournesols (Sunflowers, 1888), and La Chambre à coucher (The Bedroom, 1889), will all be projected onto the floors and walls of the Atelier des Lumières. The artist’s unique style, characterized by clouds, suns, and portraits, comes to life, evoking the artist’s boundless, chaotic, and poetic inner world. The itinerary’s central theme is be based on the various stages of his life, like his time spent in Arles, Paris, and Saint-Rémy-de-Provence. Visitors will be able to admire the vast collection of projected images, from the first works to those of the later years, from his sunny landscapes and night scenes, to his portraits and still lifes. The Dutch painter’s works are characterized by vivid and powerful brushstrokes which lead to bold colours and an unmatched style. The entire exposition highlights a perpetual dialogue between light and shadow. The artist’s palette opens the digital exhibition. With its solid and generously applied colours, it highlights the expressive vigor that distinguished his works throughout his life. The painter’s pictorial method and Van Gogh’s penetrating stare will appear, captivate visitors, and invite them to enter his inner world.